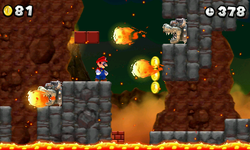 World 6 is the sixth and final normal world that appears in New Super Mario Bros. 2. 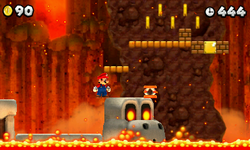 This world is a lava world, similar to World 8 of New Super Mario Bros. Wii and New Super Mario Bros. 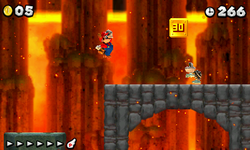 This world can be accessed by completing either World 5-Castle or World Flower-Cannon. 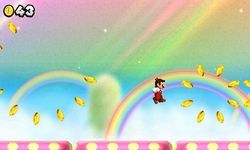 There are four Toad Houses in this world, two red, one green, and one yellow. 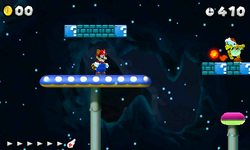 There are 11 levels in this world, six of them are the normal levels, one of them is a Ghost House, one of them is a secret level and there is also a Rainbow, a Fortress and a Castle level. 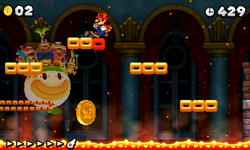 Bowser is the boss of this world. 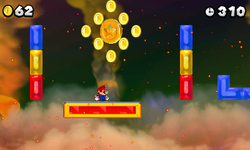 This page was last edited on April 6, 2019, at 01:11.